It’s a testament to the tremendous growth in Celiac Disease awareness that in one of the area’s best college towns – Newark, Delaware – I’m able to walk along Main Street and choose from three gluten-free pizza options. That’s a decision that I never thought I’d be able to make. Since the three chains behind those pies have outposts throughout the greater Philadelphia area, I decided to conduct a taste test to see which one came out on top. Although a fourth chain, Nino’s, doesn’t have a location on Main Street, I included them in this extremely difficult challenge since they have locations nearby. One word of caution if you try to replicate this test on your own: Don’t eat them all on the same day. With 13 stores in the Delaware Valley, the gluten-free pizza at Seasons Pizza is the most widely available. (It’s even sold at Citizens Bank Park and PPL Park.) The medium-sized pizza is reasonably priced (I paid $10.50 for it, plus a fountain soda) and it was ready in about five minutes. What impressed me most with this pie was that it tasted like a traditional pizza, with the same type of cheese and sauce. The crust was on the thin side but it held together like wheat-flour dough. My non-gluten-free friend thought it tasted better than conventional frozen pizza – similar to a thin-crust style – and commented that it was one of the better gluten-free foods he’s tried. The only downside with Seasons is you can’t customize your gluten-free pizza – just one size and one style, with tomato sauce and cheese. At Peace A Pizza (seven area locations), you’ll find the most expensive gluten-free pie, but will also get your money’s worth. I paid $15 for a 12” pie (same price as a conventional 14” pie) and was able to customize my toppings; I went with the bacon cheeseburger this time, but I recommend the buffalo chicken based on experience. Another non-gluten-free friend told me it was the best pizza she had in a long time, gluten free or otherwise. The thin, pliable crust made this pizza even better. The odd thing about Peace A Pizza is that they don’t have any information about the gluten-free pizza on its website, but walk inside and you can’t miss the signs. I found the staff in Newark to be friendly and knowledgeable (they used a separate pizza shovel for the gluten-free pie). Don’t feel obligated to eat the entire pie in one sitting. Peace A Pizza’s gluten-free pizza tastes great right out of the fridge the next day. Grotto Pizza is a downstate mainstay, but has several locations in New Castle County. 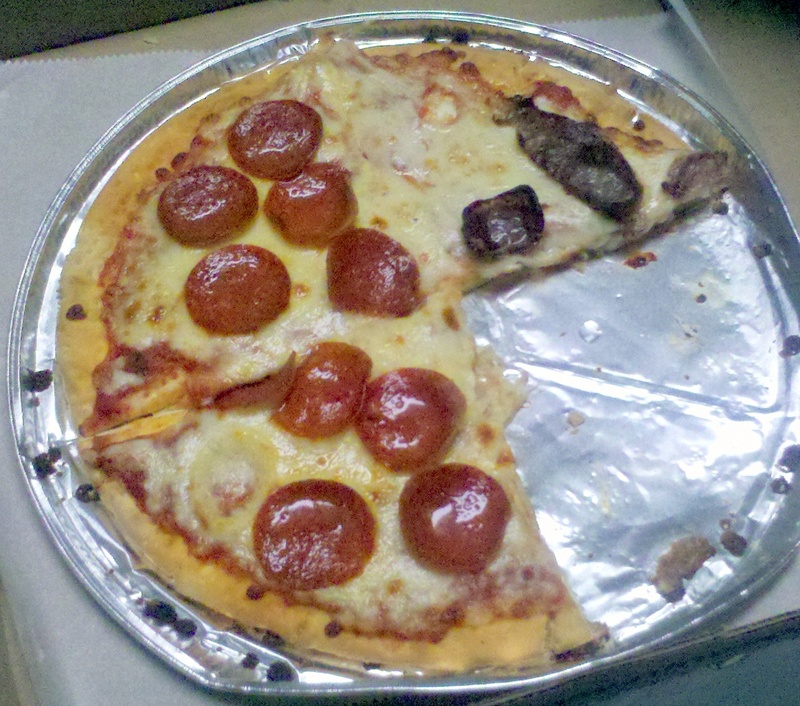 At $9.99 for a one-size-only 9” personal pie, it was the one pizza I surveyed in this test (did I mention that this was an extremely difficult test?) that has a crust most like a traditional pie – airy and tender. Grotto is known for its signature sauce swirl, similar to boardwalk-style pizza. The staff at Grotto took care to make sure I got what I ordered. While I wouldn’t make a pilgrimage to try this pizza, It’s a solid option if you’re traveling in Delaware since you’re bound to be near one. To mix things up a bit for this extremely difficult taste test, I ordered a gluten-free pizza delivered from Nino’s Pizza’s Middletown location. (Others are scattered throughout northern Delaware and there’s one in West Chester.) I was a bit uneasy placing an online order for the gluten-free pizza since I didn’t speak to anyone before it arrived at my parents’ house and feared that something would go awry on the gluten-free front. All was fine, however, and I dutifully dug in. The gluten-free pizza was relatively small and only comes in one size ($9.99 including toppings). I found it to be average but I liked the idea of having a choice of toppings and the convenience of delivery. My mother thought it tasted similar to a frozen pizza. 4. Grotto – Good taste; small, can’t customize toppings. Despite having the most expensive gluten-free pizza, Peace A Pizza won out on taste for me. But I’m spoiled with all of these options close by. You won’t go wrong even if only one of these four shops is an option. Just an FYI about Grotto Pizza. We have had gluten free pizza at numerous Grotto's in Delaware (Dewey, Rehoboth and Lewis) and we were able to customize the pizza every time. In Newark the first time I went a year ago they said it only came with one size and topping, then when I went back to review it again the menu explicitly stated "one size, one topping." I'll have to get pizza at the beach next time! Just wondering the cross contamination likely hood of these. I am relatively new to gluten free and quite frankly am driving myself crazy with trying to avoid cross contamination. It seems very likely that there would be high risk at these considering they are probaly using the same prep area and oven? It is something to be cognizant of, although these pizza places use a tin pan or other surface to prepare and bake the gluten-free pies. You should also ask them to use separate sauce and cheese that hasn't come into contact with flour from the wheat pizzas. When I went, I did not ask them to do anything special with the pizzas and I watched them use a separate pizza shovel for the gluten free pies at Peace a Pizza and Grottos, and I assume the other places do the same thing. However, I think they all use the same oven for the pizzas, so if you are super sensative to cross contamination it can't hurt to be careful, but I always assume it's the risk you take when going out to enjoy real food, and for me it's always worth it. I'm not very sensitive to cross contamination, but I've never experienced any problems and wouldn't expect to have any problems, but every restaruant experience is different so there is always a risk unless you're eating at a completely gluten free restaruant. Seasons in NJ will also customize toppings as well.